Contestants of season 8 of The Biggest Loser lost hundreds of pounds. Yes, hundreds. But then, they gained it back. Some of them are even heavier now than before the show. Did they stop exercising? Nope. Did they start to binge-eat again? The researchers don’t think so. A recent study may help to shed some light on why drastic and rapid weight loss is not sustainable. Danny Cahill was the winner of season 8 of The Biggest Loser. The dude is a stud. He started at a whopping 430 pounds. At the end of the show, he was down to a lean, athletic 191 pounds. Sadly, over the next year, he gained back 100 pounds of the lost weight. Danny was not alone in his struggle to maintain the weight he had lost. Kevin Hall, a federal researcher followed success stories of the biggest loser for up to 6 years after the show. The results he found are disheartening. Although many still exercise and eat healthier than before the show, the weight is still coming back on. The problem, Hall says, is their metabolism. Most of the contestants are now burning 400-1000 less calories per day than someone of their size would be expected to burn. Sean Aglaier is a music pastor at a church in Charlotte North Carolina. 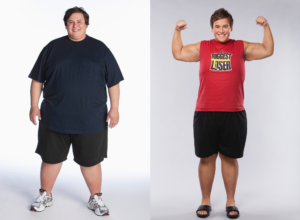 Sean made an amazing transformation, losing over 250 pounds during The Biggest Loser. Now, he has gained all of the lost weight back and then some. He now burns about 500 calories less per day than would be expected for a man his size. This is the problem. I wouldn’t consider these dieters “successful”. Yes, they lost a TON of weight. But, they did it with a drastic crash-diet and over-exercising. It’s totally normal and expected for the body to respond by going into ultra energy conservation mode. When you go on a low-calorie diet and pair it with intense and long exercise sessions, your body will freak out. Our bodies become very efficient (read: very few calories burned at rest). My answer to Kevin Hall, is that people should not be going on diets or exercise-regimens like contestants of the biggest loser. Not only is The Biggest Loser strategy unfeasible in the long-haul, it’s also detrimental to long-term success. With our 30-Day Village Fitness Challenge, we want to help people lose weight. Even more than lose weight, we want to help our clients develop habits that will keep them lean long after the diet is over. There are a few aspects of the Biggest Loser diet and exercise program which are destructive. Here are a few of the big ones. Exercise is great. In the right amount, exercise, especially lifting weights, can help facilitate weight loss. When an overweight and sedentary person goes from nothing to 2+ hours of exercise per day, the weight initially falls off. The first week, it’s 15 pounds, then 10, then 5. Their often down 30 pounds in the first month! They feel great and think they’ve found the answer. Eventually, weight-loss stalls completely. Frustration sets in and they give up. Biggest Loser contestants exercise for at least 4 hours per day. This is about the recommended amount for an entire week. I would even say this is more than enough exercise for a week. In our 30-Day Village Fitness Challenge, we recommend people do 2 to 3 weight lifting workouts per week (about 45 minutes each), 2 short interval workouts (20 minutes or less), a hike or walk on Saturday (1 hour or less), and a 10-minute yoga workout on Sundays. In total, its just over 4 hours of exercise per week. It’s enough to get the results our clients want without taking their body to the aforementioned freak-out. If you’ve watched The Biggest Loser, you know just how hard the contestants work out. They are often taken past the point of exhaustion. It’s not abnormal to see a contestant puke a few times during a workout. But our body can only handle so much. If we are always pushing to the point of exhaustion, the dreaded overtraining will set in. When you get into overtraining, your body goes into the same starvation mode as it does with over-exercise. If eating 500 calories a day leads to a pound of weight loss per week, wouldn’t 2000 calories less per day lead to 4 pounds of weight loss per week? Not so fast, amigo. Yes, you will lose weight quickly at the begging when you eat way less calories than your body needs. But, your weight loss is destined to stall as your body goes into conservation mode. We are impatient. We want our bodies to look great yesterday. Marketers play off of this. They promise us 10 pounds of weight loss in a week. Deep down, we know this doesn’t work. Yet, there is still something very appealing about the thought of our problems going away quickly. What you need is a change in your habits. Exercise for short amounts every day, include challenging resistance training 3 days a week, a few interval workouts, and lots of sunshine. Make changes to the way you eat. Adopt a new habit like eating slowly, stopping at 80% full, or eating veggies and protein with every meal. Get in a community of people pursuing health and fitness. Surround yourself with like-minded folks and success will be much easier. Focus on adopting new habits and doing them every day instead of the end-result. 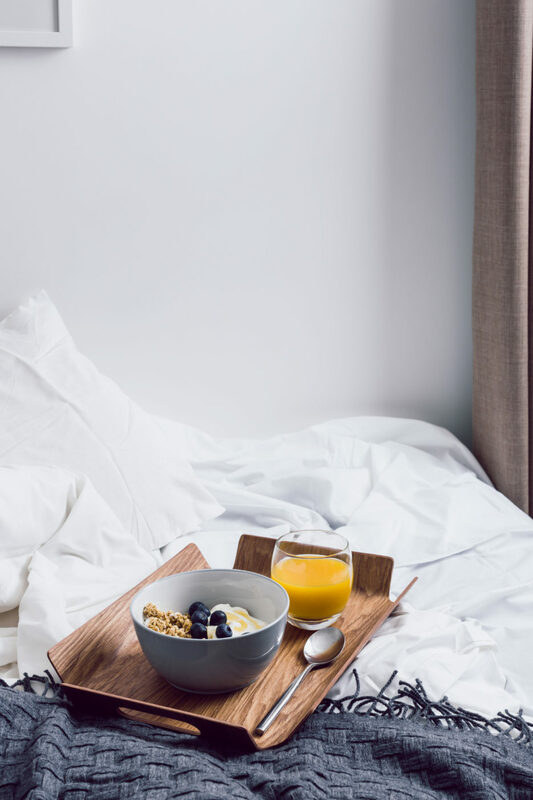 Instead of trying to will your body to lose 10 pounds in a month, will yourself to exercise as I outlined above every day for the month and adhere to a nutrition habit or plan every day of the month. The weight-loss will take care of itself. Our 30-Day Village Fitness Challenge is the perfect jump-start to long-term fitness success. It’s not a crash diet or crazy exercise plan. It’s a sensible, real-life approach to fitness. The 30-Day Village Fitness Challenge incorporates effective and efficient workouts with a great-tasting, healthy meal plan for 30 days. You can join us online or in-person. For the in-person group, you will do 3 small-group personal training workouts per week here at Village Fitness Glendora with our amazing staff. Both groups will receive a 30-day nutrition plan and nutrition tips throughout the program. Looking forward to seeing you in-person or online soon. Your weight loss journey sounds amazing! What a great accomplishment. I will send you an email with more information on the challenge.